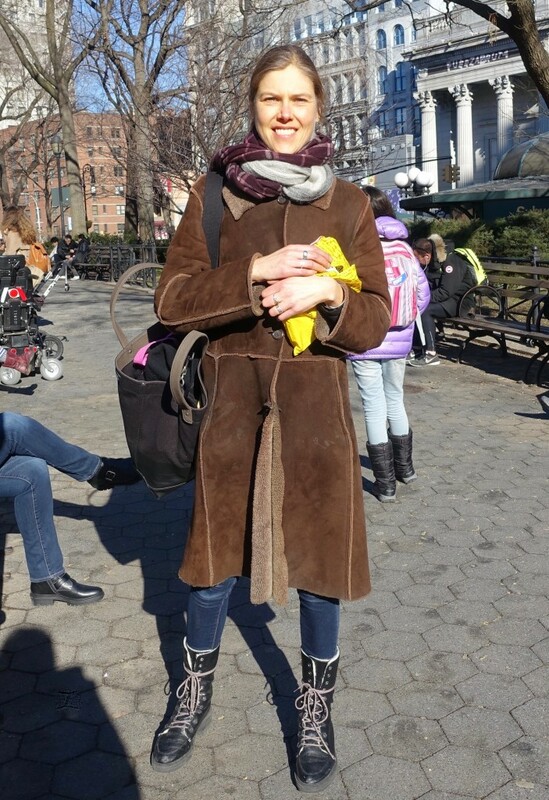 Last week, Liliya proved to us how a fabulous coat and scarf can make for a totally chic winter ensemble. 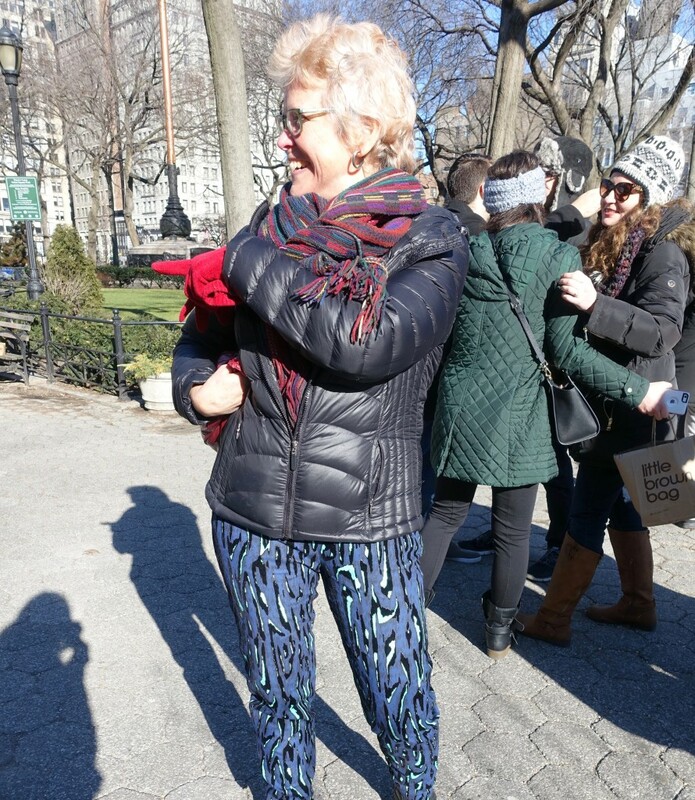 I can’t think of a better way to express your personal style on a blustery sidewalk! On the day of photographing her outfit, we met for brunch at Balthazar in Soho, and from there, we took a walk to Union Square. En route, I started shooting – with my inconspicuous camera at waist level – other eye-catching winter looks as they passed by us. 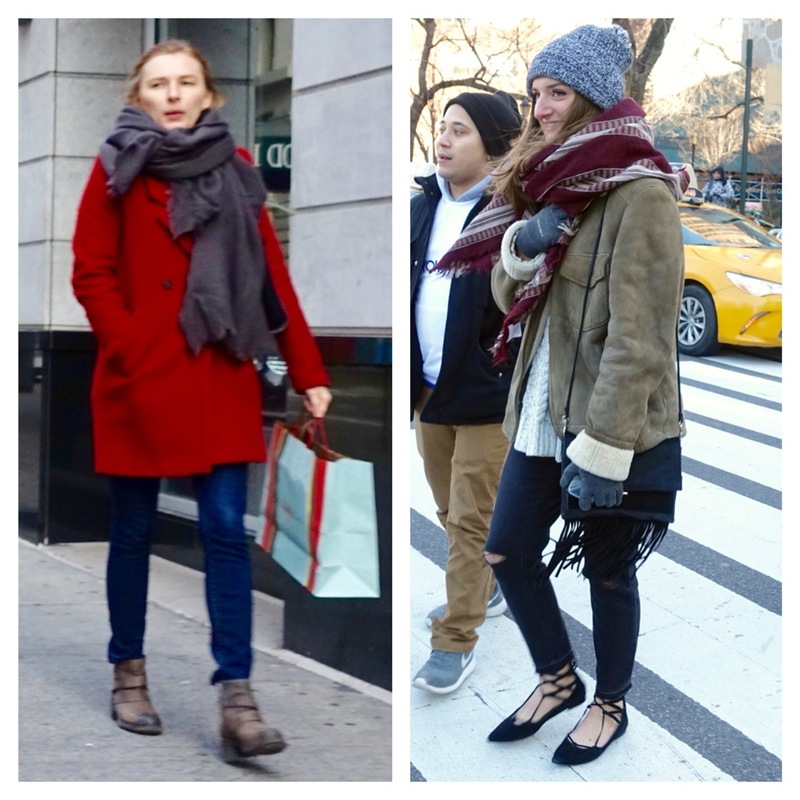 What I especially noticed were some pretty cool scarf tricks – and how often they can totally make a winter look. I welcomed this information, since after a recent move from California to Seattle, I’ve had to start assembling a cold-weather wardrobe – not a quick, easy process unless you are, like Kendal Jenner, fortunate enough to work with a personal stylist. It is also helpful that scarves require a relatively smaller monetary investment than other pieces. Here are 15 of my favorite scarf images, which I hope will inspire you as they have me. 1 & 2 – There are so many ways to tie a scarf – why not make up your own signature method? I love the example to the left (below) because it insulates the neck and hangs down to visually lengthen the silhouette. While the one on the right might not stay pretzeled on its own in the wind, the proportions and color make it a huge style boost. 3 – And who would have thought to twist two scarves together? These LF boots are also statement-making. 4 – Now a scarf-sweater is a show-stopper. The woman below is a double threat 😉 with this piece and her Philipp Lim moto jacket. 5 – An ivory infinity scarf is a great basic. And it works well with an otherwise all-black New York edgy ensemble. 6 – Ivory is a great way to brighten up winter outfits, period. This wasn’t the first example I saw of a really long scarf being tucked into a long coat and peeking out at the bottom – interesting! 8 – …while a more artisanal design is more suited to an eclectic look. I love the scarf below with these super unique Provenza Schouler trousers; the black in the trousers is actually a different (velvety) texture. …especially if it has a touch of gold and fringe. As she described in her last post, these scarves are responsible for inspiring several fashion designers – I can see why! 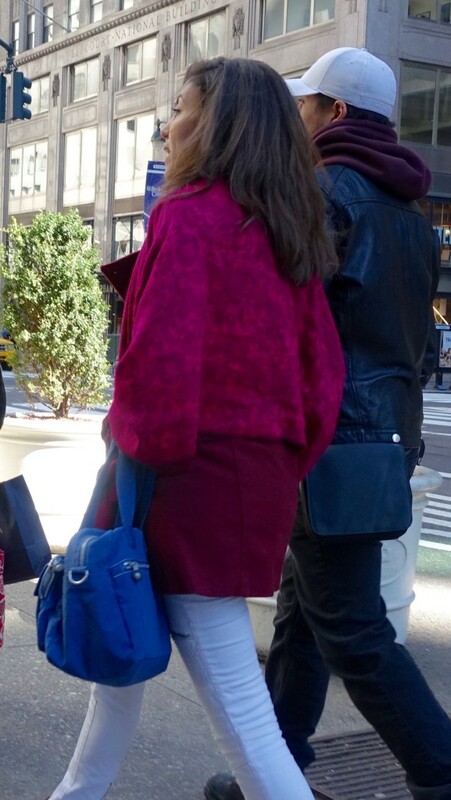 11 – Here is another interesting look: a decorative shawl-scarf over a solid-colored coat in a similar hue. 12 – A decorative lightweight silk scarf can create a delicate, feminine accent. 13 – Another lightweight scarf does a lovely job of pulling together a southwestern palette. Sometimes I think twice about wearing a particular scarf when I notice that it “cuts up” my silhouette, but this wrapping method with a “tail” avoids that and makes the whole look more cohesive. 14 – A bandana in a similar (bright) tone to this jacket also avoids breaking up the silhouette. 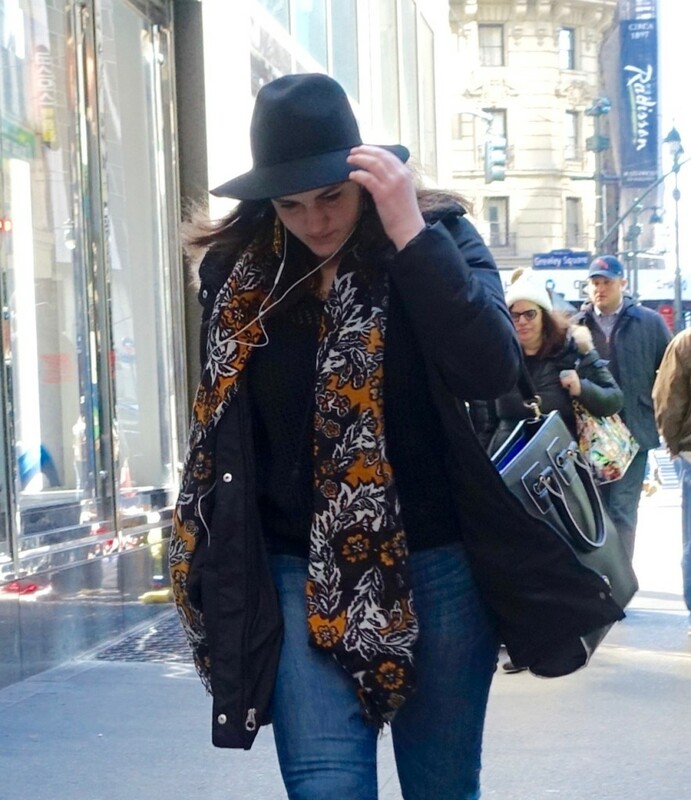 15 – Or the same bandana can act as a lively shot of color with an otherwise all-black look. On the day of this shooting, the sun brightened up the streets, but winds were biting. A scarf was pretty much necessary, but I love how some people seemed to take extra care in their selection. I hope these images might spark your sartorial creativity or motivate you to dig out a long-neglected scarf to wear in a fun, new way. And if the weather is already becoming friendlier for you, perhaps you will be inspired to pick up a special scarf at an end-of-season discount for next year. Happy scarving! I love the scarf…makes a difference in your look! I totally agree, Fabrizio. Thanks! Janea ??? ?